Playing with Papercrafting: The Daisy Delight Bundle is Back for Blog Candy!! For some time, the Daisy Delight Bundle from the new Annual Catalogue was backordered and off-line, as demand was greater than expected, but the good news is that that has been remedied and it is now available for ordering!! I finished cutting, winding, and sorting all my ribbon shares last night and they are ready to put in the mail! That was a big job that took several episodes of a Netflix series and by the time I'd finally finished, I noticed that the sun was coming up already! And I have had a terrific month for sales and I have just promoted, so I'm feeling very thankful to my customers and I've realized it's been a really long time since I've given away any BLOG CANDY! Not only that, but in less than a week, CANADA turns 150 years old! So there are so many reasons to celebrate right now! 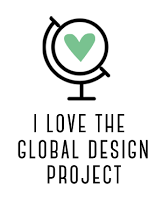 I was working on a big project yesterday that I was hoping would have been done in time for my Monday blog post, but it was just too big to finish in time. 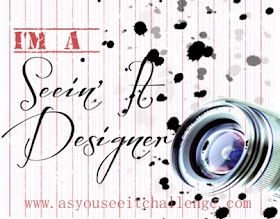 I'm giving you a little sneak peek here, and I'll show you the finished product in my Wednesday post! All that to say, that I've decided to have a Giveaway! Some Blog Candy to help you celebrate with me! What am I giving away? 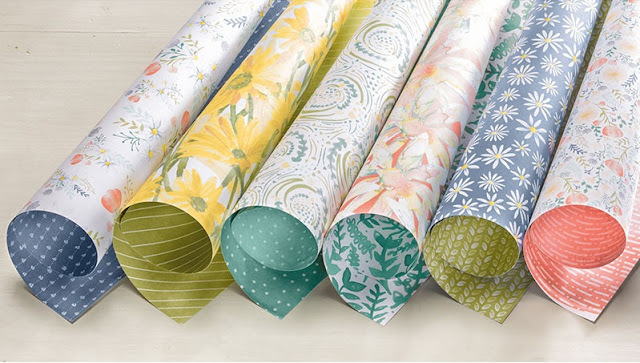 The Daisy Delight Bundle, which includes the Daisy Delight stamp set and the Daisy Punch, and a pack of the Delightful Daisy Designer Series Paper! I will be mailing this prize out to one LUCKY Canadian winner after the event closes on CANADA DAY, Saturday, July 1, 2017!! On Canada Day, Saturday, July 1, 2017, at 11 pm Pacific Time, I will enter the number of all the comments into a random number generator to pick the winner! If you are the winner, and you are CANADIAN, I will get your contact information from you and have your prize delivered right to your door! I can hardly wait to hear from all of you! It's been a while since I knew who was reading my blog, so I'm sure it will help to reshape my reality! Haha! **Once again, this event is limited to Canadian residents only! SU is my favourite cardstock and I love the colours! Daisy Delight is so cute! 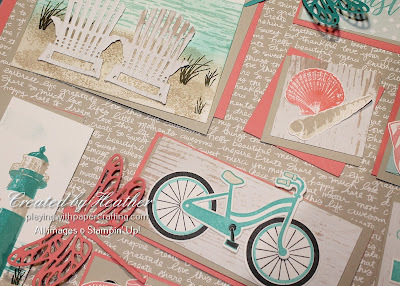 Playing with Papercrafting has fabulous events and ideas! And lemon loaf. Sorry I can't win because I live in the US but I love your blog Heather! Haven't been to Canada yet but looking forward to traveling there soon. Well thanks for commenting anyway, Donna! I wish I could include my American readers! Thanks so much, Holly! I have to say, though, that I love your style too! It's just as amazing! I love ❤️ our country, we've got some of the most beautiful landscapes and warmest people in the world.... Just like the person who wrote this blog! I'm really enjoying the freedom of playing with all this SU stuff ... thanks so much! Thanks for the comment, Gail! I'm so glad to have you coming to my classes! You bring such a spark of warmth and fun to them! Congratulations on your promotion! Great to see all your hard work paying off. 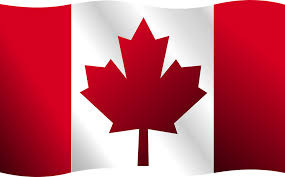 Canada - freedom for all who live in this fine country. Freedom means so many things to so many different people. 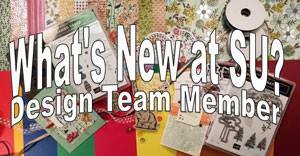 Stampin Up - What can I say.....I am SO excited that I finally signed up..... I Love the company,the choices I have made, the schedule I am keeping, and especially love the products!! I love Canada! the people, the beautiful landscapes. I love SU and its products, and especially since I am color challenged, the way everything color co-ordinates. I love Playing with Papercrafting (well mostly Heather who is PwP). She is so creative, kind and patient. The Daisy Bundle, last but not least, is such a fun and happy set to create with! I love it that most canadians are soooooo friendly! I love living in Canada. So many beautiful places and sights. The wide open spaces, the high mountains and beautiful lakes. The feisty fish that I sometimes catch and usually release. 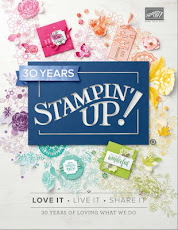 I love Stampin' Up products. The colors, the stamps, the punches, framelits and thinlits. And of course the ribbon and bling. Everything works together so well. I love Playing with Papercrafting and look forward to reading your blog. I learned how to create cards with a superb teacher and patient encourager. Not to forget to mention, a good friend! 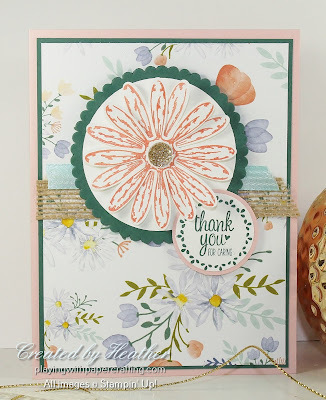 I love the Daisy Delight stamp set and the daisy punch. It made me smile the first time I saw it, and I still smile every time I see it. Thanks for all your comments, Jan, Sandra, Deb, Dianne and Eunice! I love the freedom of Canada. I love crafting so I appreciate the variety that SU offers. And I love your blog because I feel like I can snoop on what you've been up to and you don't even know it!!! Canada is a wonderful country, our freedoms we sometimes take for granted are so valuable, the freedom to worship is high on the list of freedoms as is our freedom of speech. 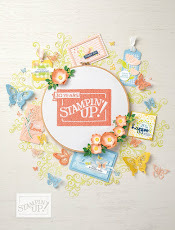 I love your blog Heather because I am constantly finding new things about Stamping Up I didn't know. Awesome company!